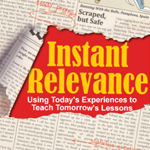 On Episode 25 of the Instant Relevance Podcast, Denis (@MathDenisNJ) and Raymond (@blended_math) are LIVE from the Blended and Personalized Learning Conference in Providence, RI! The hosts met in person for the first time and interviewed educators, innovators, and change agents throughout the symposium. Episode 2 in our 3 part series focuses on reaching all students regardless of the circumstances. The hosts begin by interviewing author of "Pathways to Personalization - a framework for school change" and Cheif Education Officer for the Highlander Institute - Shawn Rubin (@ShawnCRubin). Next, Jonathan Santos Silva (@j_santossilva), Bridge Fellow with TNTP, talks about overcoming traditional gatekeeping in education and educating for equaity. Then, Matthew X Joseph (@MatthewXJoseph), leader, educator, speaker, and author of “Power of Us” discusses creating active learning experiences to engage all learners. Check us out next week for Part 3 of 3 where we share resources and techniques for creating equitable learning spaces.